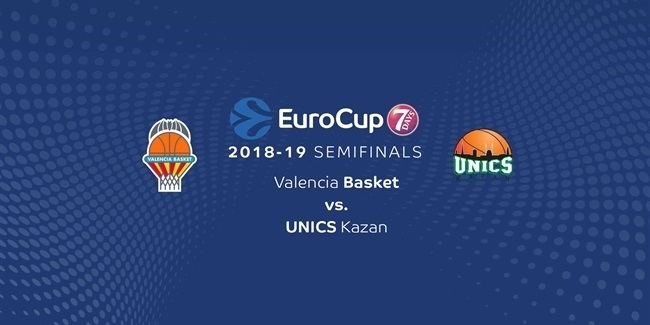 It’s going to be a titanic struggle in the 7DAYS EuroCup Quarterfinals when German power FC Bayern Munich takes on former champion UNICS Kazan of Russia in a best-of-three starting on Tuesday, March 6. No quarterfinals series will feature two assist men as good as those in this encounter; UNICS’s Quino Colom ranks fourth in the EuroCup this season with 5.9 assists per game and Stefan Jovic of Bayern is fifth with 5.5. Jovic, who missed half of the regular season due to injury was second in the Top 16 with 6.0 assists per game. Colom, who has not missed a game yet in the current campaign, is just 8 assists behind Lietuvos Rytas Vilnius’s Chris Kramer (103) for the most assists this season. The passing of Colom and Jovic is contagious; UNICS has to more players producing good assist numbers: Anton Ponkrashov has been worth 3.8 assists per game off the bench and starting shooting guard Jamar Smith has averaged 3.1. For Bayern, which leads the competition with 20.6 assists per game, Reggie Redding is second on the team with 3.7 per game. Both Bayern and UNICS are led by a dominant big man; Devin Booker (13.3 ppg.) shines for Bayern and former EuroCup champion Stephane Lasme (15.1 ppg.) leads UNICS and is the competition’s leader in blocked shots (2.5 bpg.). The two rank among the best among centers in most major stats this season. Lasme leads all centers and is third overall in performance index rating per game at 20.0. Booker is second among centers in index rating per minute (30.2 prorated over 40 minutes). And they are not alone. Since losing Milan Macvan to a season-ending injury, Bayern’s frontline has seen Maik Zirbes step up with 14.5 points and 4.0 rebounds per game off the bench and Danilo Barthel, who was the Top 16 Round 5 MVP in just his second start of the season, has posted 16.0 points on 9-of11 shooting (81.8%), 5.0 rebounds, 5.0 assists and 2.0 blocks. 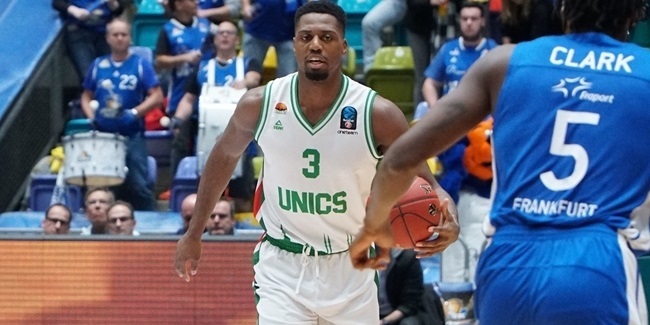 UNICS power forward Melvin Ejim produced his best game of the year in the season-saving road win in Top 16 Round 5 at ASVEL Villeurbanne with 16 points, 13 rebounds and 3 blocks. Maurice Ndour gives UNICS athleticism and toughness off the bench to ensure that that the matchups in the paint in this series will be exciting for all 40 minutes in every game. Bayern has a flavor that blends German and Serbian basketball, starting with head coach Sasa Djordjevic, himself a former head coach of the Serbian national team. There are three more Serbians on the roster – Jovic, Vladimir Lucic and the injured Macvan – in addition to Bosnian native Nihad Djedovic and Zirbes, who had his breakout seasons playing for Crvena Zvezda Belgrade. The UNICS squad blends Russian and Greek basketball; head coach Dimitris Priftis was a longtime assistant on the Greek national team, where he coached currently injured forward Kostas Kaimakoglou. Lasme had some of his best seasons in Greece with Panathinaikos, with which he won the 2013 EuroLeague Best Defender award. There are not many common threads between the squads, but there are a few. Djordjevic also coached one season in Greece with Panathinaikos, where he squared off against Priftis and Aris Thessaloniki. Lasme made his EuroLeague debut with Partizan back in 2008-09; a young Lucic practiced with that team. Lucic later teamed with UNICS shooter Danilo Andusic at Partizan. UNICS’s Smith played one season in Germany for Brose Bamberg in 2013-14, where he teamed up with Zirbes. UNICS guard Trent Lockett made his European debut in Germany with Braunschweig in 2014-15. Since we traditionally judge teams by past performance, there is one trend that bodes well for Bayern but is worrying for UNICS. Bayern has played three other EuroCup quarterfinalists this season; it swept two games from Buducnost VOLI Podgorica and split games with Grissin Bon Reggio Emilia in the regular season and beat Zenit St. Petersburg twice in the Top 16. Bayern’s overall record against those quarterfinalists this season is 5-1. 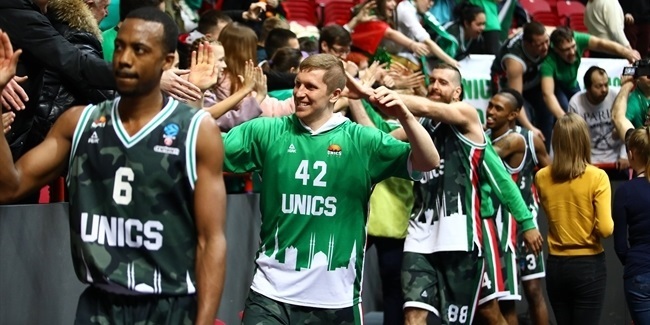 UNICS has only played two teams that have reached the quarters; it lost twice to Darussafaka Istanbul in the regular season and twice to Reggio Emilia in the Top 16 for a 0-4 record against quarterfinalists. Of course, none of that will matter if UNICS is able to beat Bayern, but thus far against the toughest competition, Bayern has proven to be up for the challenge. We will see if UNICS can be up for its biggest challenge so far.